Elements of Software Process Assessment and Improvement reviews current assessment practices, experiences, and new research trends in software process improvement. The newly revised chapters are expanded from articles that appeared in SPN, The Software Process Newsletter of the IEEE Computer Society Technical Committee on Software Engineering (TCSE). This book describes in detail the process improvement cycle, including diagnosing an organization, establishing a business case, changing elements within a process, and evaluating the impact of these changes. These elements are divided into four parts providing a comprehensive view of the software process improvement field. The first part describes contemporary models that are used to evaluate an organization's processes and capabilities. The next covers the business case for assessment and improvement by providing ample evidence that demonstrates possible improvements as well as evidence of assessment reliability. Part three provides application guidance covering critical success factors including tools and techniques. The final portion covers important and exciting developments that enhance process improvement tools and the reader's understanding of organizational processes in practice. These four elements answer the needs of individuals involved in software process improvement as well as those involved in basic and applied research. 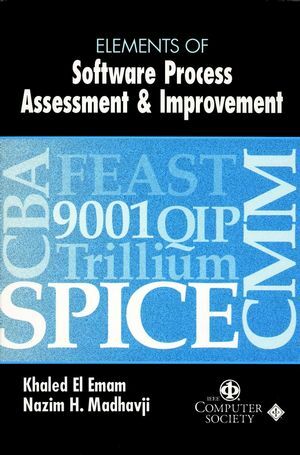 Elements of Software Process Assessment and Improvement is an invaluable source of practical information for software process professionals. Khaled El Emam is currently Research Associate, Software Engineering at the National Research Council, Canada. He was previously the head of the Quantitative Methods Group at the Fraunhofer Institute for Experimental Software Engineering in Germany. Dr. El Emam is also the editor of the IEEE TCSE Software Process Newsletter, the current International Trials Coordinator for the SPICE Trials (which is empirically evaluating the emerging ISO/IEC 15504 International Standard world-wide), and co-editor of the ISO's project to develop an international standard defining the software measurement process. Previously, he worked in both small and large software research and development projects for organizations such as Toshiba International Company, Yokogawa Electric, and Honeywell Control Systems. He obtained his Ph.D. from the Department of Electrical and Electronics Engineering, King's College, the University of London (UK) in 1994. He was previously a Research Scientist at the Centre de recherche informatique de Montreal (CRIM) in Canada. Chapter 1. The Capability Maturity Model for Software (Mark C. Paulk, et al.). Chapter 2. Risk Management in Software Product Procurement (Francois Coallier, et al.). Chapter 3. The SPICE Project Jean-Normand Drouin). Chapter 4. Software Process Assessment and Improvement: 5 Years of Experiences with Bootstrap (Hans Stienen). Chapter 5. ISO 9001 for Software Organizations (Sam Weissfelner). Chapter 6. The People Capability Maturity Model for Improving the Software Workforce (Bill Curtis, et al.). Chapter 7. An Inductive Method for Software Process Improvement: Concrete Steps and Guidelines (Lionel Briand, et al.). Chapter 8. The Economics of Software Process Improvements (Capers Jones). Chapter 9. The Payoff for Software Process Improvement: What it is and How to Get it (Herb Krasner). Chapter 10. Empirical Studies of Software Process Assessment Methods (Dennis R. Goldenson, et al.). Chapter 11. Essence and Accidents in SEI-Style Assessments or "Maybe this Time the Voice of the Engineer Will be Heard" (Ken Dymond). Chaqpter 12. Tailoring the CMM for Small Businesses, Small Organizations, and Small Projects (Donna L. Johnson and Judith G. Broadman). Chapter 13. Starting the Climb Towards the CMM Level-2 Plateau (Ray Dion). Chapter 14. The Role of Design Analysis in Process Improvement (William W. Agresti). Chapter 15. Action Planning (Joseph Puffer). PART 4. Chapter 16. Modeling Software Processes Quantitatively and Evaluating the Performance of Process Activities (David M. Raffo and Marc I. Kellner). Chapter 17. Metrics and Laws of Software Evolution-The Nineties View (M.M. Lehman, et al. ).